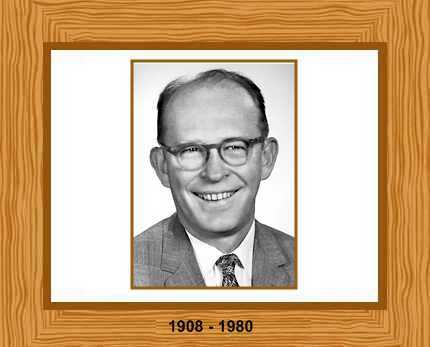 Willard Frank Libby (1908-1980), a Nobel Prize laureate and Guggenheim Fellowship recipient was a pioneer in the use of differential decay of the Carbon 14 Isotope for dating organic materials; what we now call radiocarbon dating. He addressed this scientific puzzle after developing a gaseous diffusion enrichment process for uranium-235. His work also involved the identification, separation, and control of ‘heavy water’ containing deuterium and tritium, both isotopes of Hydrogen. These processes were important to the building of the Hiroshima bomb. Through his post-war appointment to the Atomic Energy Commission, he embraced the cause of peaceful nuclear use. Libby received the 1960 Nobel Prize for Chemistry for “his method to use Carbon-l4 “for age determinations in archaeology, geology, geophysics, and other branches of science”. Willard Frank Libby was born on December 17 in 1908 in Grand Valley Colorado. One of five children, his parents Ora Edward Libby and Eva May Libby (Rivers) were farmers and the family moved to an apple ranch north of San Francisco in 1913. His parents encouraged him to go to college. Willard attended elementary and high school in Sebastopol, California and earned the moniker “Wild Bill” from his American football skills. In 1927 Libby enrolled at the University of California at Berkeley with the intention of becoming a mining engineer. However he found chemistry more interesting and he was awarded his degree in 1931. Continuing his education, he earned his doctorate in 1933 with his thesis “Radioactivity of ordinary elements, especially samarium and neodymium: method of detection.” Libby was then appointed as an instructor in the Department of Chemistry and taught there until 1941. He worked initially to develop Geiger counters for the detection of background radiation from soils and rock formations; what homeowners call radon gas. His Guggenheim post-doctoral fellowship took him to Princeton, but with the outbreak of WW II hostilities, he was recruited into the Manhattan project at Columbia University, a massive mobilization of top scientists to develop an atomic weapon. Libby’s biography must record his innovation in techniques used to separate and concentrate uranium isotopes through gaseous diffusion. Post-war, he taught at the Enrico Fermi Institute at the University of Chicago. He made the connection between the amounts of tritium, an unstable isotope of Hydrogen, in water, and the action of cosmic ray bombardment in the highest levels of the atmosphere. Only trace quantities of tritium are found in any body of water, but once the water is isolated from the atmosphere, it no longer acquires new tritium molecules. This observation led to pioneering techniques for dating water bodies, and identifying different currents of water in the ocean. This line of research also led him to discover that the bodies of all organisms, whether plant or animal, absorbed trace amounts of the Carbon 14 isotope only during life. He reasoned that the steady radioactive decay of this other unstable isotope could provide a way to measure the time elapsed since death. The technique of documenting the degree of decay of the Carbon isotope, C14, in dead tissues, immediately proved useful. This technology has been immensely helpful to many branches of science, especially archeology and paleontology. Its value to science was recognized in the Nobel Prize he received in 1960. Libby believed fully in the possibilities and promises of atomic science, and carried this message for the Eisenhower administration into the media and on the lecture circuit. Libby’s advocacy for atoms for peace while with the Atomic Energy Commission did, however, put him publicly at odds with some other noted scientists, for example, Linus Pauling, who believed that all testing should cease immediately. Libby put his belief in the survivability of nuclear attack into practice in the construction of his home fallout shelter, which famously burnt immediately upon completion. His enthusiasm occasionally could lead to nearly laughable missteps; for example, he counseled the residents of a rural town with one solitary through-road to flee to the countryside in case of attack. Since this course of action would have been a virtual guarantee of traffic gridlock, and starvation or dehydration would unavoidably await anyone attempting this strategy, his audience took his advice with the proverbial grain of salt. No such silliness detracts from the facts of his contribution to every discipline that deals with time – radiocarbon dating assures him a place in the pantheon of the greats. Libby married Leonor Hickey in 1940 and they were divorced in 1966; the same year he married Leona Woods Marshall. From his second marriage he had twin daughters, Janet and Susan. Libby died on September 8 1980, aged 71.